Last year, my district was fortunate enough to partner with Scholastic in their research study, Summer Reading Spotlight: Stoughton 2017. We collaborated to examine the benefits of building students’ home libraries and engaging families in summer reading activities. The Stoughton Public Schools serve more than 3,800 students at the Edwin A. Jones Early Childhood Center, five elementary schools, the O’Donnell Middle School, and Stoughton High School. The District embraces the wide diversity of its student population, and seeks to foster appreciation for cultural differences. Getting the right books into kids’ hands is the key that unlocks the door to the ultimate goal: engaged readers. When we are able to provide our students with access to a wide range of interesting text, the effects on comprehension and motivation to read are enormous. Teachers do this every day in our classrooms. However, summer can sometimes present a challenge—and so often we see what many refer to as a “summer slide” (the loss of learning when school is not in session), which is a reality for millions of students. This research study partnership provided an opportunity to dive deeper into the summer slide to learn more about it and find ways to help kids avoid it. Often when people first hear about the research, they tend to say, “Well of course reading over the summer helps! That’s no secret!” They’re right—reading over the summer helps decrease the dreaded summer slide. However, our district was able to take away some valuable lessons learned to help increase the accessibility of books for all students. So often we focus on our striving readers, making sure they have plenty of books over the summer. Someone recently asked me, “Well, what is your plan for all of the other students?” This hit home for me. 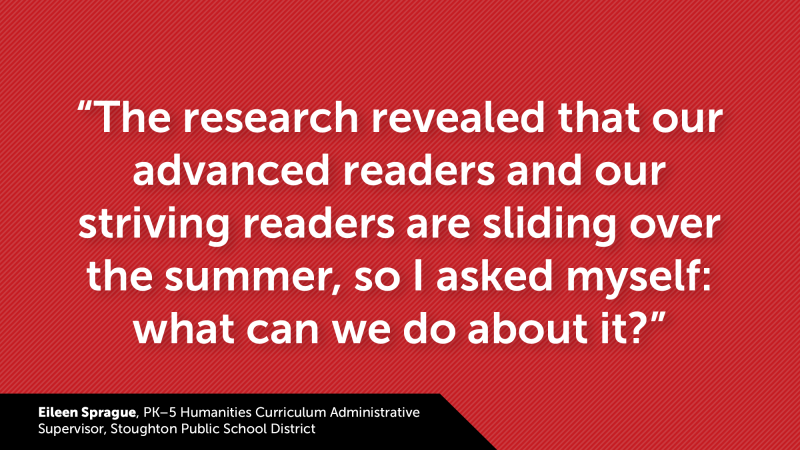 The research revealed that our advanced readers and our striving readers are sliding over the summer, so I asked myself: what can we do about it? I had made an assumption that our advanced readers would be fine—they would ‘find their way’ to books over the summer. I was wrong. I started by going directly to my most valuable and trusted resource—the students. I asked them questions about summer reading: What they liked, what they didn’t like, and how I could help them read more over the summer. What they told me was the truth—the best part about their experience with Summer Reading Spotlight: Stoughton 2017 was getting to read brand-new books, having the ability to choose what they read, and to keep them as their own. Striving or thriving—I found that many of them cannot make it to the library, if they have books on their shelves at home they have already read them, or they are unable to get to the bookstore. Why? Because life is busy! Summer is busy! Kids are busy! Families are busy! This past week, I have been visiting all of our elementary schools during their “Summer Reading Kick-Off” events. As soon as I walked into the buildings, waves of students began coming up to me to show me what they had chosen! Students were walking down the hallways with their heads down, reading a book. Groups of students were discussing common books that they had selected. One group even planned out dates to meet for a summer reading book club! This study has positively impacted the learning and attitudes of so many of our students throughout all of our schools. Having students choose their own books to read over the summer showed them that we value their choice, interests and opinions - while simultaneously communicating that reading every day is important, especially in the summer. Our district is already looking forward to next summer. Since the research that has been released is so revealing, we would like to continue to support summer reading going forward. We want to be able to offer our students and families access to books and support over the summer, and are currently seeking ways to ensure we have the resources to continue.